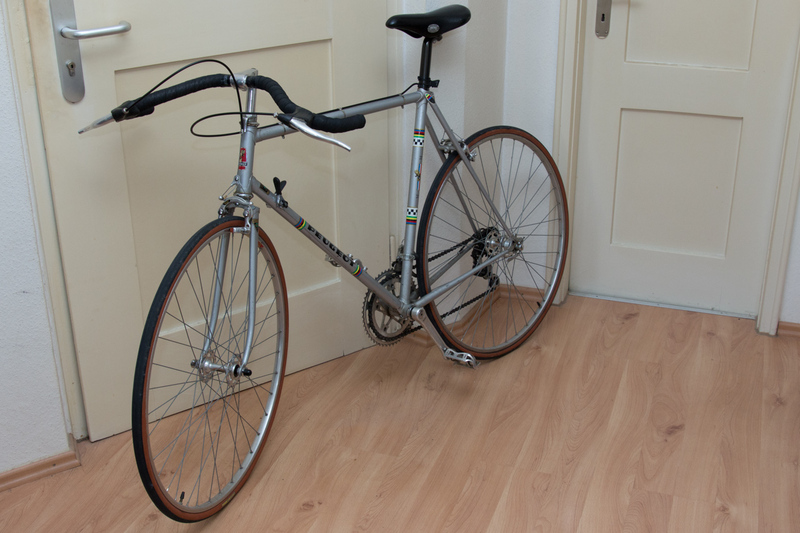 Nearly two years ago I had the opportunity to buy an old Peugeot PX-10 in a very good condition. With a longer seat post, new handle bar tape and new brake pads it also still rides quite good. 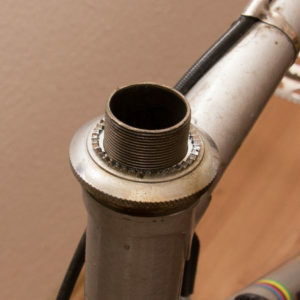 However the drop handlebar and the quite stretched posture on the bicycle caused by this is not very suitable for rides in the city which I did realize not at least on my last ride at the critical mass. For the upcoming sommer I wanted to have a bit more comfortable solution. A good compromise which also allows to use the old brake levers is a “moustache” handlebar. 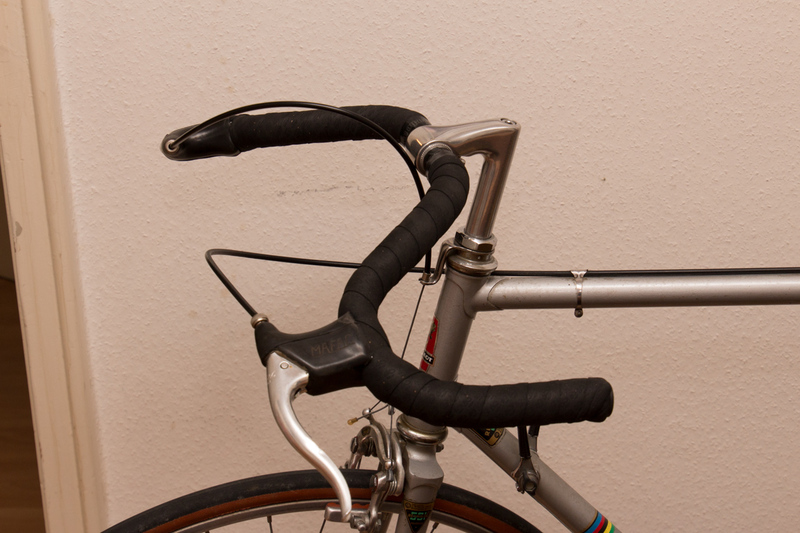 With this kind of handlebar you don’t sit so stretched and the brake levers are reachable quickly. 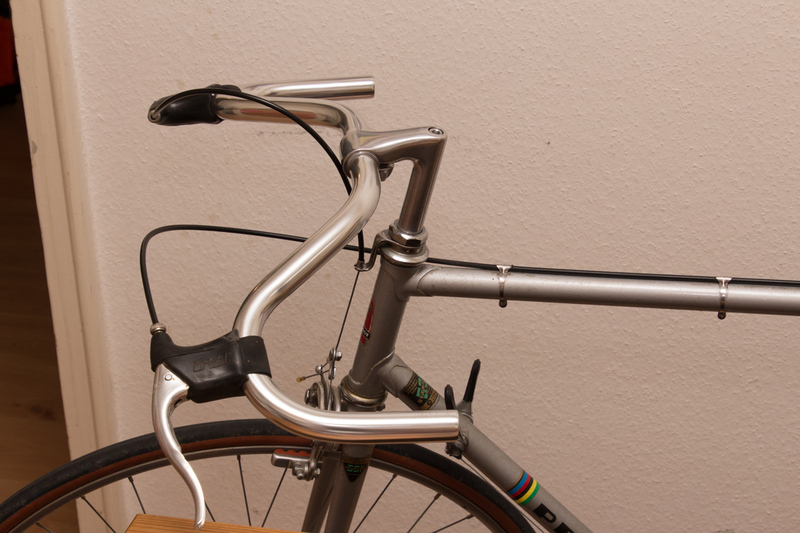 I found a suitable handlebar – but the stem was too long so I wanted to replace it with a shorter model. 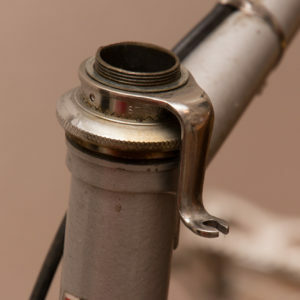 Usually this kind of modification is not a big deal: Remove the old brake levers, loosen the headset and the stem, pull out the stem and mount the new stem with the new handlebar. However the old french bicycles don’t use standard components. 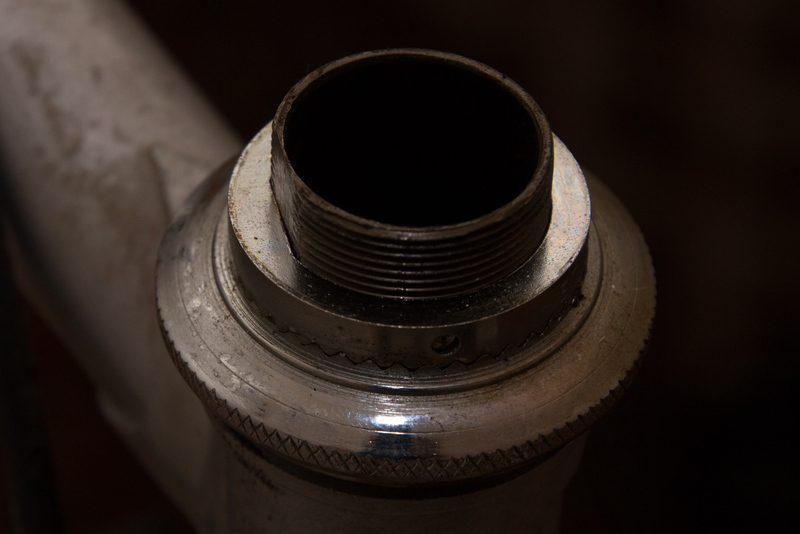 The stem has a diameter of exactly 22 mm and not 22.2 mm as usual. 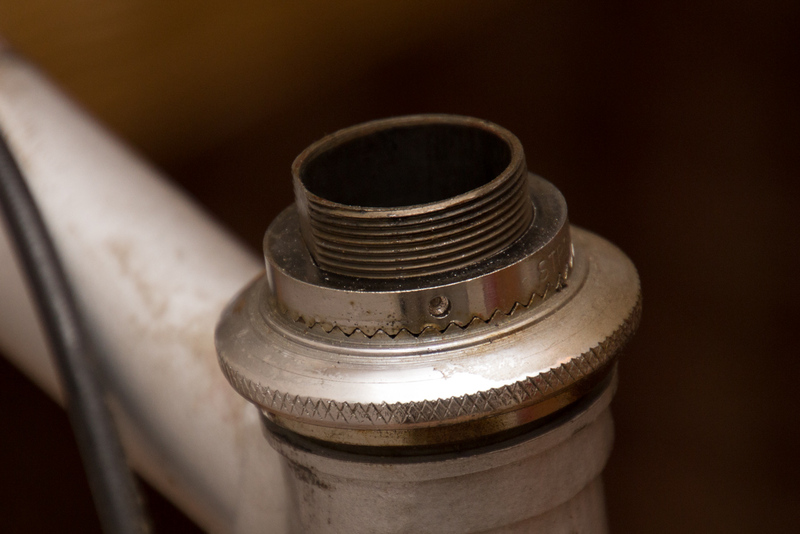 Also a speciality: The screw in the stem to tighten the cone needs an allen key with 7 mm. The regular sizes for allen keys are 6 or 8 mm. Fortunately I found a shop where I could get a suitable stem and I could also find the unusual allen key so the modification was possible now. 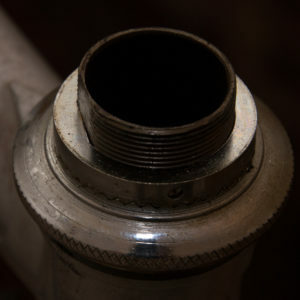 After removing the old stem I had a closer look at the construction of the headset. 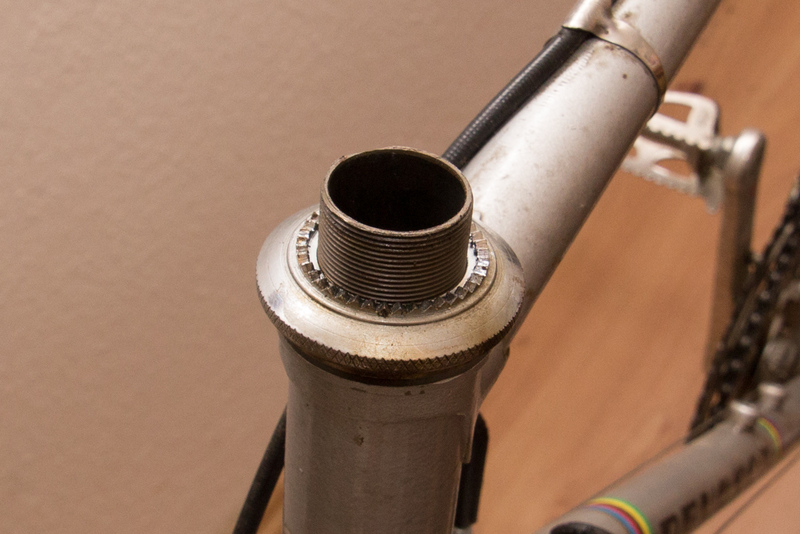 This variant was new to me: The fork tube is flattened on one side and the cone has a fluted ring on which you put the counterpart which can not turn due to the flat side of the tube. 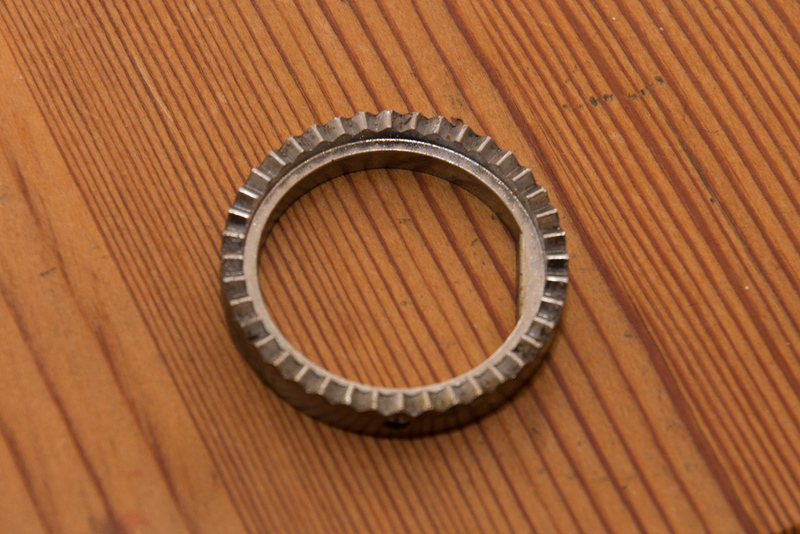 First you adjust the bearing as usual and then you secure the position with the ring which can not turn and therefore secures the cone. 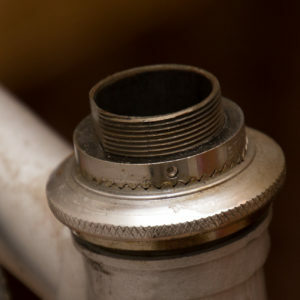 The new stem fitted exactly and so the remaining work did not take a lot of time. The orientation of the handlebar with the middle part upwards and not downwards is set by the brake levers. 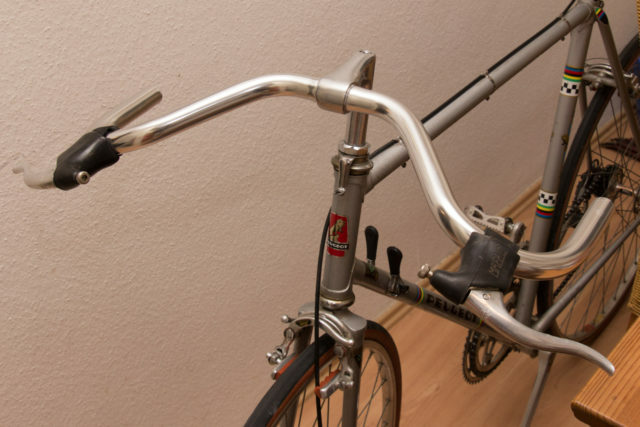 The levers have to be in one line to the handlebar to follow the curves and you don’t want the levers to point upwards which would be quite cumbersome to operate. The result is still a more “sporty” position but much less streched as with the drop handlebar. The shorter stem also provides a bit more comfortable position but you still have different handle positions to choose from. The next summer may come :-). I just have to think about a solution to mount the battery light in a stable way (Busch & Müller Ixon IQ, the rear light on the seat post is stable). 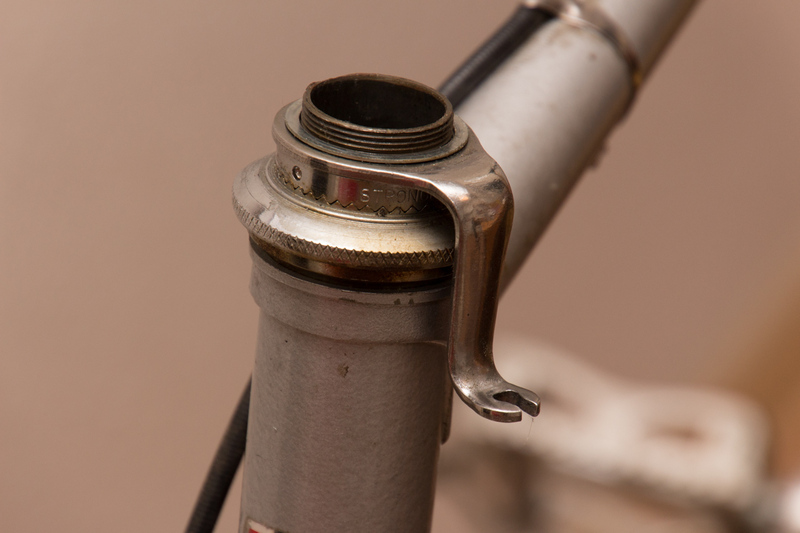 The provided handlebar mount by Busch & Müller does hold very good and on the fork crown there is not enough room. 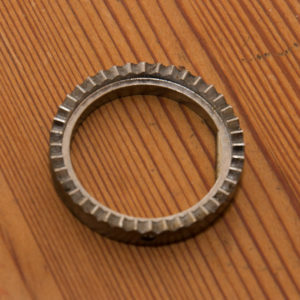 Probably I will use some mount on the stem since I don’t want to ride without light, even in summer.